Based in the Denver, Newmont Mining Corporation (NEM) is the largest publicly-traded gold miner by equity market capitalization. Its geographic segments include North America (the U.S.), South America (Peru and Surinam), Australia and Africa (Ghana). Newmont’s share price rebounded sharply in 2016, outperforming its peer group, as new, more profitable mines came into production replacing those that were sold in 2014 and 2015. The company continues to execute on its plan to increase production (mostly so far to replace developed reserves) and reduce production costs through targeted mine and mill expansion projects. In 2017, Newmont produced 5.65 million ounces of gold and 113 million ounces of copper. 93.3% of total gold production, equal to 5.27 million ounces, was attributable to Newmont; the remaining 0.38 million were allocated to non-controlling interests (i.e. joint venture partners). 2017 sales were $7.35 billion and pre-tax profit was $1.09 billion; but the company recorded a net loss from continuing operations of $49 million, due primarily to tax remeasurements and restructurings associated with the Tax Cut and Jobs Act (TCJA). On a GAAP basis, Newmont recorded a 2017 loss of $0.18 per share, including a loss of $0.11 per share from continuing operations. That compares with a 2016 loss of $0.41, including a loss of $1.18 per share from continuing operations. Adjusted (non-GAAP) EPS, which excludes discontinued operations and certain unusual items, such as the TCJA tax costs, was $1.46 per share, up from $1.17 in 2016. 2018 YTD Results. For the first half of 2018, NEM’s gold production fell 8.6% to 2.53 million ounces. Copper production was declined 5% to 57 million pounds. The declines were due in large part to stripping campaigns (i.e. removal of the overburden to expose the ore) at four mines (Carlin and Twin Creeks in the U.S., Boddington in Australia and Yanacocha in South America). Partially offsetting the production decline, the average realized price of gold increased 3.4% to $1,292 per ounce. Average copper prices were also up 21.5% to $2.99 per pound. As a result, net sales declined by only 2.4% to $3.48 billion. In this same period, Newmont’s weighted average cost applicable to sales (CAS) for gold increased 10.8% from $677 per ounce to $750 per ounce. The sharp increase in CAS, which was in line with management’s full year guidance, was due primarily to the stripping campaigns. Newmont’s copper CAS per pound increased as well, by 23.2% to $1.90. Although CAS increased, other expenses and costs declined slightly. Newmont also booked gains on the sale of royalty interests and its stake in Maverick Metals. With less debt outstanding, its interest expense declined sharply. Those factors helped Newmont overcome the modest decline in net sales, allowing its 2018 first half pre-tax income to rise 11.2% to $588 million. Net income jumped 82% to $477 million, due to a sharp TCJA-related decline in its effective tax rate. GAAP EPS was $0.91 compared with $0.42 in 2017, with $0.84 from continuing operations, up from $0.49. On a non-GAAP basis, which excludes the asset sales gains and TCJA tax cuts, adjusted first half EPS was $0.61, down from $0.72 last year. 2018 Projections. Despite the first half production decline, Newmont reaffirmed its full year gold production guidance of 5.3-5.8 million ounces, with attributable production of 4.9-5.4 million ounces. That is a fairly wide range. Based upon first half production, management’s guidance implies that 2018 second half production could range from 2.8-3.3 million ounces, which in percentage terms would be down 4% to up 13.3% against prior year levels. My current projections assume 2018 second half production of about 3.0 million ounces, which would represent an increase of 2.9% over the prior year. According to the company’s guidance, the rebound in 2018 second half production will come from productivity gains and start-ups of new mines and extensions, which will allow it to reach higher ore grades in Africa and the Americas. Similarly, Newmont has affirmed its guidance for gold CAS of $700-$750 per ounce in 2018. Actual gold CAS for the 2018 first half was $750; so it seems likely that full-year CAS will be somewhere in the top half of the guidance range. My projections assume a second half gold CAS of just over $700 per ounce, which is a substantial improvement over the first half. That translates into a full-year gold CAS of $725 per ounce. Given the recent decline, the gold price outlook for the balance of 2018 is in question. Newmont realized an average price of $1,310 per ounce in the 2018 first half. The company does not hedge its gold (and copper) production; choosing instead to sell its gold in the spot market, which gives investors full exposure to any price fluctuations. Assuming that the price of a gold ounce continues to hover around $1,200 for the balance of the year, I estimate an average full year realized gold price of $1,250 per ounce. 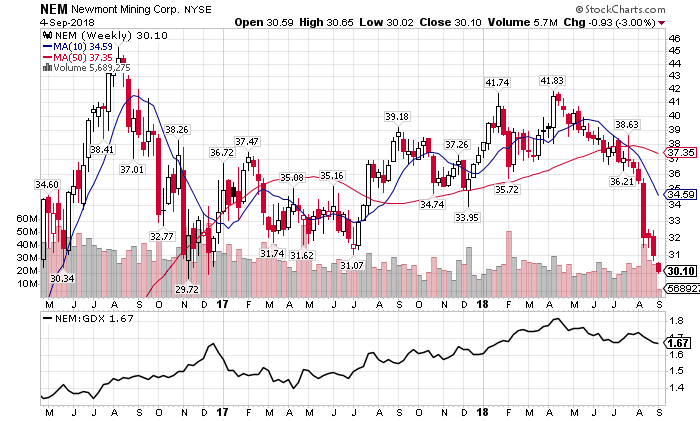 Taken all together, the combination of production at the low end of the range, CAS at the high end of the range and a gold price of $1,200 per ounce for the 2018 second half translates into full year projected GAAP EPS from continuing operations of $1.31 and adjusted (non-GAAP) EPS of $1.11, which is below the current range of $1.18-$1.50 of analyst estimates. 2019 Projections. For 2019, I anticipate 5.7 million ounces of gold production (and sales), an average price of $1,240 per ounce and CAS of $650 per gold ounce (which is within management’s guidance range of between $620 and $720 per ounce). Those major assumptions produce GAAP and adjusted EPS of $1.53 per share. The increase in 2019 EPS over 2018 is due entirely to lower CAS and a 3.6% projected increase in unit volume. 2020-2022 Base Projections. At its investor day in December 2017, Newmont’s management also provided base assumptions for 2020 to 2022. These included average annual attributable production of between 4.6 and 5.1 million ounces, all in sustaining costs of between $870 and $970 per gold ounce and annual capital expenditures of between $580 and $680 million (more than 90% of which represents expenditures intended to sustain existing production levels). The company also indicated that it has basing its project investment decisions on a $1,200 gold price. All-in sustaining costs per ounce are defined as CAS plus other costs and expenses (e.g. reclamation, development, exploration and general & administrative) plus sustaining capital expenditures. Newmont sees all-in sustaining costs of between $965 and $1,025 per ounce in 2018 falling to between $870-$970 per ounce in 2019 and beyond. In recent years, all-in sustaining costs have been about $230 per ounce higher than CAS. Using these base assumption ranges, I calculate that Newmont would generate free cash flow (defined as net income plus depreciation and amortization minus capital expenditures) of between $700 million and $1.3 billion annually during the 2020-2022 forecast period. Assuming that management can achieve these targets, Newmont would generate a significant free cash flow, even if gold stays at $1,200. The company would probably not let this free cash flow pile up on its balance sheet. It would use that free cash to invest in or acquire additional mines or mining projects or it might return some of that cash to shareholders (hopefully through higher dividends). Over the past year, Newmont’s Board of Directors has raised its dividend twice, from $0.20 annually to the current level of $0.56 annually, an increase of 180%. At the current level, the stock offers a dividend yield of 1.9%, the highest in its peer group. If gold remains near $1,200 and Newmont still generates free cash flow, I expect that the company would increase the dividend further to provide a more competitive return and compensate long-term investors for the lack of appreciation in gold prices. Financial Strength. While a $1,200 per gold ounce assumption seems conservative, it is entirely possible that the price of gold could fall below $1,200 per ounce for some period of time, which might wipe out earnings and cash flow. Accordingly, Newmont has also been working over the past several years to strengthen its balance sheet. Since the end of 2014, the company has reduced its total debt by 38% from $6.6 billion to $4.1 billion at mid-year 2018. Its ratio of debt-to-total capitalization has improved from 47.9% to 32.2%. With $3.1 billion of cash on the balance sheet at mid-year, its net debt is about $1.0 billion. Debt Maturities. Newmont’s debt is rated Baa2 by Moody’s and BBB by Standard & Poor’s. The next bond up for repayment is the 5.125% Notes due October 2019. There are $626 million of these notes still outstanding, down from $900 million at issuance. The notes, which are subject to a make-whole call, recently traded at 101.87 to yield 3.332%, which represents a spread of about 85 basis points over the comparable maturity Treasury. After the 5 1/8s, the next bond up is the 3.50% Notes due March 2022. There are $992 million of the 3 1/2s outstanding, down from $1.5 billion at issuance. The notes are callable at par and recently traded at 99.62 to yield 3.614%, which is a spread of about 90 basis points over the comparable maturity Treasury. With its $3.1 billion of cash and no borrowings under its $2.5 billion credit facility, Newmont has ample liquidity to fund its operations and meet these upcoming debt payments. Still, it would not be imprudent for the company to issue debt within the next year or so to take out both the 5 1/8s and the 3 1/2s in order to extend debt maturities. In its previous two bond issuances in 2009 and 2012, the two tranches of 10-year and 30-year notes. At current yields and prices, Newmont would have to be willing to incur a higher interest expenses on new issues in a refinancing. Stock Valuation. At the current price of $30.11, Newmont’s stock trades at 23 times the 2018 consensus estimate of $1.31 and 20 times the 2019 consensus estimate of $1.50. Those multiples are in line with the averages for the company’s peer group, which consists of ABX, AEM, AU, AUY, BVN, GFI, GG and KGC. The company’s implied 2018-2019 EPS growth rate of 14.5% also supports forward multiples in the low 20s (from a price-to-earnings growth perspective). Beyond 2019, management’s guidance and an assumed average realized gold price of $1,200 would result in a sharp decline in EPS (even though the company would generate positive free cash flow). As noted, this represents a base case looking at the company solely on a sustainable production basis and does not factor in future growth projects, acquisitions or returns of cash to shareholders. Gold Price Sensitivities. Although it is possible that the price of gold may fall below $1,200, it is unlikely to remain there for long because that would eventually trigger a supply response. At an industry average all-in sustaining cost of say $1,000 per ounce, gold miners would begin to curtail their exploration and development activities as the price of gold approaches $1,000. If the price of gold were to approach the industry average CAS of say $800 per ounce, gold miners would eventually be forced to curtail current production activities (a process that would likely be facilitated by bankruptcy filings). In this pricing environment, Newmont seems very well-positioned to wait for a rebound in the price of gold. Its focus on productivity and cost control combined with its strong balance sheet gives it the staying power to weather lower prices for a considerable period of time. Accordingly, Newmont seems like a good choice for investors who expect that the price of gold will go up eventually and are willing to be patient. The stock’s current 1.9% dividend yield, which will likely be increased over time, provides an acceptable rate of return for what is ultimately a hedge against a quick pick-up in inflation and financial market volatility. This entry was posted in Materials, NEM and tagged gold, gold mining stocks. Bookmark the permalink. One Response to "Newmont Mining: A Safer Bet on Gold Mining"